Trying to go off-grid @Home, and warming up to getting real (spendy). Trying to get more done with my off-grid PV pilot, and working up to grid-tie too. Adjusting the angle of the solar panel to best catch the sunlight, especially in winter, much nearer 30° from vertical than my initial installation. Considering adding something like a PowerFilm solar Quadrant 'tent' as a summer sunshade for our west-facing living room, with a ~200Wp capacity. At ~£1000, or ~£5/Wp it is not cheap, but not outrageously expensive for a specialised product. Try an ultracapacitor for energy storage instead of lead-acid (given environmental problems of lead use). Note that 40Ah 12V Pb-acid battery stores ~1MJ+, which implies about 10kF (10,000 Farads) at the same voltage to store the same energy. A home-built VAWT and several more home-baked designs, and some more, and a good general discussion with the major point that "lift" designs are more efficient than "drag", but more complex, and this OtherPower thread. To make my system more realistic and less of a pilot, one route would be to cover my study (ie home office) electricity requirements more fully for some or all of the year. Some of this is predicated on cutting down on the power currently used, by upgrading to more efficient gear, especially computer equipment that could be powered from low-voltage DC rather than mains AC to minimise 'inverter' losses. Lighting (worst-case winter) @ 30W (efficient CFL/LED) x 12h/day = 360Wh/day. Laptop @ 50W x 12h/day = 600Wh/day. Networking/servers @ 200W x 24h/day = 4800Wh/day (just one of my current servers consumes more than this). Total: 25A@12V (quite a chunky controller and battery system), ~6kWh/day, ie ~2MWh/year. Can this be covered at all, and especially in winter? Note that reverting to mains power in winter is perfectly viable and reasonable if I'm still managing to offset some CO2 emissions in summer, so I should try to spec this for maximum and minimum solar flux, ie a ratio of about 4:1 from high summer to deep winter on average. 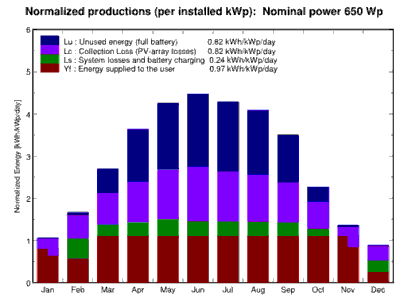 Assuming 2MWh/year constant power consumption, 80% of solar power/flux available in summer, and a maximum of 0.9MWh/kWp/year DC supply efficiency, that implies something like a need for an installed 2.5kWp solar panel array to cover summer usage and a 10kWp solar panel array to cover power consumption in winter. Looking at it another way, with total insolation in the UK something like 1MWh/m2/year and solar PV ~15% efficient, this implies a need for ~13m2 of solar panels in summer but 53m2 in winter to supply enough power. And another aspect: maybe £5/Wp for the solar cells at best, so £12,500 to cover summer use but £50,000 for year-round power coverage if battery storage is assumed to be only a day or so at most. I simply don't have that space and money available, and the numbers are predicated on actually a very low power budget for the always-on Web and email servers, etc, as currently set up. So how could this be made to work in the real world? 'Wake on network activity' servers. Discs that shut down (spin-down) automatically when not being used. Solid-state (eg Flash) discs, at least for critical files that need to be saved quickly/often. Using computing equipment with good power-management facilities (already essential in laptops and 'car PC' EIPA/ITX machines) that shut down CPUs and other energy-hungry internal components when not needed. Power-profile tweaks such as the Linux 'laptop-mode'. Running power-intensive workloads only when power is available (eg only run major updates when the sun is actually out), which implies some power monitoring available to software, or some approximations such guessing that the sub will be brightest at noon most days. It is difficult to know how much difference each of these can make, but power-sensitive equipment such as laptops already work hard to use them. An additional benefit of making hay (only) while the sun shines is a potential drastic reduction in the amount of battery storage required since then only core services and lighting need to be powered in the dark. As an initial step to assess how I might move my business electricity consumption to solar, I have ordered a PM230 kWh meter so that I can get a better idea of where I'm burning energy now, thus allowing me to see what changes may actually help and to start trimming, which will also help me keep my office temperature lower in summer! Laptop @ 30W x 12h/day = 600Wh/day (50W is for a continuously heavily-loaded laptop). Always-on laptop for services such as mail and Web servers @ 30W x 24h/day = 1200Wh/day (we may be able to do better and defer some activity until we have enough sunshine and thus 'excess' power available). DSL @ 14W x 24h/day + WiFi @ 12W x 12hr/day = 480Wh/day, but possibly always from mains and thus excluded from our solar power system. Even if not solar-driven, reducing my study's energy use from the current ~9MWh/year to <1MWh/year is quite dramatic and should save several tonnes of CO2 emissions. Round 3: ignoring study lighting, what would be the minimum solar power to make my home Internet connectivity 'carbon-neutral' when I'm not at my desk? That implies covering the DSL router, and the laptop/server on minimum power (eg screen off, discs spun down as much as possible, but accepting emails, etc) unless the batteries are fully charged and the sun is providing 'excess' power. Laptop/server @ 25W x 24h = 600Wh/day. DSL router @ 14W x 24h = 336Wh/day. Total: ~1kWh/day from solar (3A+@12V), ie ~350kWh/year, so maybe 500Wp (2.5m2/£2500) of solar panel for summer, and maybe 2kWp for winter. In the winter I can manually revert to mains power when the battery gets low, and be extra-miserly with laptop/server power too at this time, but put off this reversion with a PV system somewhat over-sized for summer. (Note that expected lighting energy use is very similar to the DSL router's, so providing study lighting by solar offsets the DSL energy use.) To support even 500Wp+ of solar panel and ~1kWh/day would require an upgrade of solar controller and batteries, especially as I should probably have several days' reserve battery power to avoid unexpected outages after a few particularly cloudy days. For example, a maximum 50% discharge to protect the batteries implies that 200Ah (~£200) of battery is needed per 1kWh of power stored. Everything that can be done to reduce server power consumption would help. Something like the BrightLightSolar 650W Large Home Power System @ 650W and 800Ah storage might suffice: a simulation run by Mark suggested that all but Dec/Jan would probably be OK with this system. But at over £5000 to keep a power-starved laptop running most (but probably not all) of the year, it shows just how cheap mains power is (~£35 at 2007 London prices). On the other hand, £5000 represents only a few years' (~8) electricity use by the current system, so the 'eco-friendly' replacement is probably financially viable overall too. As this is a living experiment, I'm adding to the project as I go along. Update 2007/06/04: I've attached to a wooden baseboard the solar controller and a couple of connector blocks (and the 'car lighter socket' from the BrightLightSolar kit) to reduce the chance of confusion and short-circuit as the set-up gets more complex. I used a little softwood offcut from some earlier DIY as the baseboard. Update 2007/06/04: I bought an 'in-car' 12V DC charger (ie compatible with my PV system) for my mobile phone that plugs into the 'lighter' socket---to make one less use of mains power and to ensure that the mobile can be kept charged in case of an extended power outage, which may be especially useful in emergencies as it has Internet access. It had completed its first top-up by the time I wrote this! Update 2007/06/04: I'm now using a 3W 180° floodlight white LED as a source of indirect/fill-in lighting (from behind me), which feels much more comfortable than just using the Twin Light, and I'm using the Twin Light on one tube (8W). Update 2007/06/05: So far my solar panel has been hanging vertically on a wall, which is not optimal for power generation. Using a high-tech solution consisting of some of the panel's foam packaging, a plastic clothes hanger, and a rusty nail low down on the wall, I've pushed the panel out to about 15° from the vertical, which is better, and the panel still seems physically stable. Update 2007/06/21: I'm actually building this low-power laptop though I haven't settled exactly if and when to move to power it 'off-grid' from solar PV yet. Update 2007/06/26: I have ordered an E-Flite Power Meter to display power-draw of my 12V DC devices; it's difficult to tune power consumption without an accurate measure. Update 2007/06/27: Given that a solar PV system sufficient for winter will be hugely over-specified for summer, I've asked my domestic electricity supplier (EDF) what I need to do legally/technically from their point of view to put the excess energy back into the mains (microgeneration) on their side using (say) a Mastervolt Soladin 600 grid-tie inverter. It's not worth asking to be paid by EDF as long as (a) our domestic consumption will be at least in part covered while the sun shines and (b) EDF doesn't mind us shipping a bit of free green energy back to them from time to time. There are safety issues involved, for example, so the inverter has to be appropriately specified and certified (to G83/1). Guidelines can be found at the Energy Networks Association in their Information for Generators Seeking A Connection section and in particular the Technical Guide to the Connection of Generation to the Distribution Network. EDF has its own guidelines available online. So far everyone has been very helpful, including those normally dealing with the generation of GWhs rather than kWhs, but my estimate is that the getting a scheme agreed and installed and signed off by an approved installer and the DNO will probably take up to £2000 and six months (the inverter being ~£500). Update 2007/07/11: ES62 installed in parallel with existing 20W panel using Schottky diodes. Update 2007/07/11: SDC-M 13W 12V CFL "warm" (2700K) actually 15W as measured (and nominally ~715lm, so ~55lm/W) installed in an anglepoise desk lamp converted from mains use; this feels much more comfortable than the 'daylight' strip CFL already, tested in broad daylight! I can still use the daylight CFL too if I wish. Update 2007/07/11: Tested Vanson SDR-120W to power laptop from the battery, which works fine and uses about 21W which is about 5W less than the mains adaptor draws to power the same workload. Unfortunately, even with no load, the Vanson trips the overload/short detector on the SHS-6, and so cannot be driven by it as things stand. Update 2007/08/02: Although the LVD circuit I have built to safely power the Vanson DC/DC directly from the battery is not fully working yet, the monitor optoisolators are working fine, monitoring what my power switchover unit does, with the optoisolator outputs driving the k8055 digital inputs and being sampled on Linux in a script every few minutes. Update 2007/08/02: Low-power server/laptop is currently successfully running all of my always-on Internet services including DNS, SMTP mail, HTTP Web servers, etc, at <30W from mains power, and has been for a couple of weeks. Update 2007/08/05: Have bitten the bullet and bought the 70W Vanson from Maplin, a much better match for my laptop and hopefully a bit more efficient at typical power consumption (~20W) too. The start-up current no longer knocks out the LVD, and I have added a delay mechanism to the LVD to try to squash most oscillations. Right now the server/laptop is running off solar PV and has remained so even though it is now dusk. Hurrah! Update 2007/08/06: Needed to raise the upper hysteresis voltage to about 13.45V to kill the cycling quicker as battery voltage is rising. Update 2007/08/06: Low-power server/laptop now running on solar PV when available, est <20W from solar PV when available, ie ~0.5kWh/day. Update 2007/09/01: I now have the first full month's worth of sample data from the system (August) and some partial data for the end of July. Note that July's data is very spotty since it only covers a few (partial) days and the monitoring and power systems were being actively tweaked. For August the first few days were missed (I was away and didn't want to leave the system unattended) but the rest is fairly solid. Power status samples are nominally taken every two minutes, but there may be a few extra intermediate samples from testing. 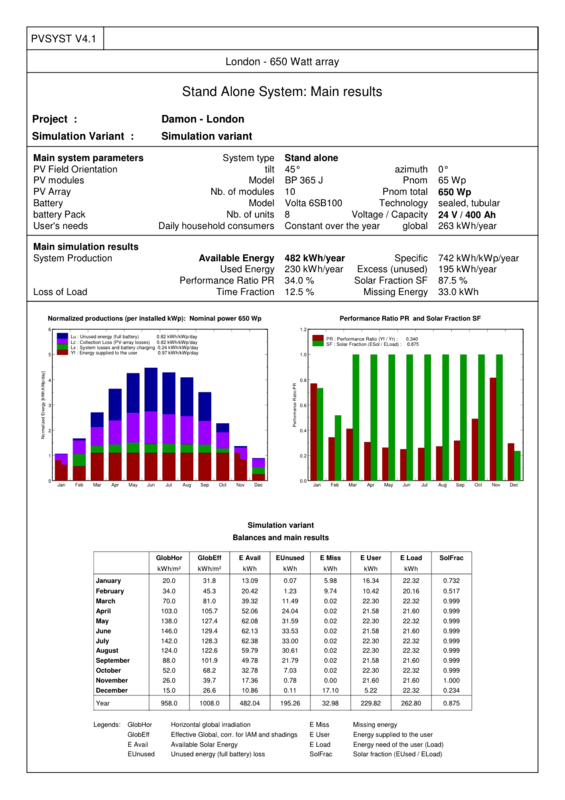 The overall %RE (percent time on Renewable Energy) figure is computed as if the samples taken were representative of the entire month. Note that there was always enough energy left over for my 12V office lighting, as much as I wanted to use, without hitting the LVD cutoff. Update 2007/09/23: Bought a 3W white LED MR16 Elco 6000K spotlight/lamp to work by; the light quality/colour is fine when used as an uplighter. with 80Wp+ of solar panel I should get 80Wh+/day even in mid-winter, which is nominally enough to run this light all day, and also represents much less than a 50% discharge of the 40Ah battery. Update 2007/10/07: Boo hiss! I decided that it was time to ensure that my summarised stats were properly archived/backed up in case of disc or operator error, but while trying to set up the backup system I managed to blow away everything from the end of July up to this afternoon. Grrr! Update 2007/10/08: Added a 68,000µF 16V power-supply electrolytic capacitor just upstream of my LVD to see if that eliminates or reduces the cycling as the laptop goes off-grid, and also if the laptop is able to stay off-grid longer with the cap smoothing out small demand spikes rather than triggering the LVD. The maximum leakage current of the capacitor is specified as 6mA, so should not appreciably add to battery drain. Update 2007/10/11: The 68,000µF smoothing capacitor does seem to be helping stabilise the power system generally, though I have not yet been nearby when the system has been going off-grid late morning to hear/see if the oscillations have stopped. A small change to the power-monitoring tools may also have helped, whereby some applications are forced into low-power mode unless excess power has been available and stable for a couple of consecutive sample periods. Today's data implies that there was no oscillation at all coming off-grid. Update 2007/10/13: The smoothing capacitor definitely seems to have killed the oscillation: it just now cut in cleanly in moderate light where before it would have taken at least two or three attempts. Shame that the smoothing capacitor has to cost 50% of the DC-to-DC converter! Update 2007/11/01: The two solar PV panels are now angled at ~70° from the horizontal, facing due south, and are in position to receive light as much of the day as possible given this time of year. They are as nearly unshaded as possible. This is the "winter" set-up for low sun (as low as 15° at noon in December). Update 2007/11/21: I've been computing the stats for the longest gap for laptop off-grid and wind power for most of October and November, and the worst gap for off-grid (which is essentially a fairly-full solar PV battery charge) is about 3 days in November and 5 in October (strange that October is worse). The implication is that a truly off-grid system would need 5 or more days of battery capacity given my PV and site, though the gap average is ~1 day. Wind is showing a gap of well over a week and ~1% availability, which suggests that it really isn't an RE contender in my part of London. Update 2007/11/25: In spite of the big smoothing capacitor, the LVD circuit can still sometimes be induced to take the laptop off-grid when I switch on the WiFi access point directly above it on my desk, presumably because of a burst of induced RF (radio) noise. I don't think it's any sort of a problem in practice, but it does add a few odd data points to my stats! Update 2007/12/20: It is more or less the shortest day of the year (ie probably least insolation) and yet I've still not needed mains electricity for lighting in my office since July, and right at this moment (13:04 GMT) my Internet-facing server is running off-grid on surplus power from my system. I'd say that this pilot is a success on those terms! Update 2008/02/17: Finally I secured the large Unisolar panel to avoid it blowing over again (it has, twice so far in strong gusts, without apparent ill effect). It's lashed with reusable nylon ties to a sturdy bush on one side and a big steel screw-eye that I put in the wall behind the panel today. I'm assuming that I won't adjust the panel's tilt much (~70°) for summer, though this doesn't stop me from moving the panel a little for performance. Update 2008/04/21: The off-grid system has become a little more 'official' now, with power being brought in to the battery in the kitchen (near an air-vent) and routed to my desk upstairs internally, avoiding cables dangling though a draghty ajar window! This means that we now also have off-grid lighting available in the kitchen. The hiatus for the rewiring is still in progress, with the laptop/server (etc) not yet relocated to my new desk (though I do have off-grid lighting and power at my new spot), and thus not able to go off-grid with 'excess' solar power. An upgraded battery system to be able to absorb the new energy and potentially hold several days' worth for my office lighting/server. For example, a Valence U27-12RT is 12.8V nominal 130AH, with >1.5kWh usable charge assuming a ~90% safe DoD (cf 50% for lead-acid), in ~1/3rd the volume and weight of lead-acid. Pricing is currently ~£1000 for delivery in the UK, possibly falling a little for the newer Epoch model due in September. The new battery would need a new controller, though I would try to retain the current battery in the system with its ~240Wh of usable power still good enough for office lighting. Extending the system's use to include my Internet DSL modem when possible, and possibly applications such as porch night lighting (~1W LED). I would still not expect to capture enough energy in winter to keep the Internet equipment off-grid all day (as well as office lighting as before), but in summer it may well be possible. Update 2008/05/10: As a warm-up and a feasibility test for the 4-panel system on the flat porch roof which is on the east of the house to try to catch some rays early in the morning from the east (all my PV is on the west of the house at the moment) and to provide a boost from diffuse light in the winter, I've put up a small amorphous 13Wp model from Maplin (N00CX, TPS-936A). It cost £50 at half list price, so still somewhat expensive per Wp at first glance, but what improves its value for money is that (a) it's a neat little ~5kg briefcase design that can be put away and (b) it comes with a solar controller and LVD and regulator for various voltages rather than just 12V. I've parallelled it with the existing controller for my small (40Ah) lead-acid battery, but positioned the panel so as not to get much light at and after noon so as not deliver current to the battery when the main panels on the other side of my house do, so as to avoid charging the battery too fast and gassing it. For an SLA (gel) that would be bad. I'll have to see how robust and efficient (eg current drawn at night) this little controller is, but for now, I'm pleased that it was there. It might even remain suitable for the new battery system being planned. Update 2008/05/24: I've replaced the temporary 13Wp panel with a permanent 12Wp weatherproof one (Maplin N31CX, from TopRaySolar) and added a 2.4Wp panel on a shallow west-facing shed roof for good measure. Both were on 'special' and came in at £4/Wp which is good for retail, especially stuff that you can see and touch in a bricks-and-mortar shop! These amporhous panels are not terribly efficient per m^2, but they should do relatively well in poor and defuse light (eg in winter). They have 5-year guarantees, so shorter than any of my other PV. If I really wanted to I could probably put several more of the 12Wp panels up in the same location on the porch roof in winter, though I'd need a new bigger regulator (and battery) if I went beyond about 4. Achieving 24h/day Internet server off-grid during the peak summer months which at ~720Wh/day (30W server+modem) indicates a minimium of ~240Wp of optimally-positioned PV and 1kWh--2kWh of storage such as from 200Ah to 400Ah of 12V SLA. Keeping the current off-grid lighting system largely intact (with the same 40Ah SLA battery in particular) and with the ability to divert any 'excess' power to the new battery set either from before the panels or after. I believe that my current 40Ah gel SLA is probably chargable at up to C/4, ie at about 10A from ~120Wp of panels (I currently have a little under 100Wp), so I might upgrade to a 10A PWM charger with a common -ve line to enable easier interconnection with any new battery and charger. A new 120Wp+ could be added on a separate controller, with an LVD to allow a significantly-deeper discharge to power the server on the grounds that the lighting power is taken care of by the other battery, though there is a danger of letting the tail wag the dog here as the existing 40Ah battery was not that expensive and multiple controllers and complex interconnections may well be more so. 24Wp of small amorphous PV panels (eg from Maplin) may be <£80. 400Ah of gel SLA (for which I find that I have a suitable ventilated cubbyhole) might set me back £400--£600. 120Wp of amorphous PV panels (eg 2xUniSolar ES62) should be <£500. A 10A PWM controller with LVD (eg MorningStar SunSaver SS10L) <£60. Update 2008/06/05: When under the additional load of the laptop battery recharging the LVD and 12V-to-20V adpator became unstable switching on and off fast (~2Hz) eventually causing the laptop to shut itself down (several times today), presumably to protect itself from 'dirty' power. I have now reinforced the wiring from the battery to the laptop (to reduce its impedance/resistance) by essentially doubling-up -ve and +ve, and this seems to have eliminated the problem for now. I may do some other rewiring and shortening elsewhere to help further, both between the battery and the solar controller and between some of the solar panels and the external junction box. Update 2009/09/25: I have replaced my Morningstar SHS-6 6A controller with a 15A MPPT controller (also Morningstar) to help squeeze a little more energy out of the panels in winter and to allow me to connect a little more PV if I wish (though that may be too much for the 40Ah gel battery). This MPPT controller works at 12V or 24V which may give me more flexibility reconfiguring my system in future. Update 2009/09/27: We had a nice sunny day today. In the morning with my high Voc (~20V) amorphous panel lit I saw the MPPT holding the input at ~17V with the battery at 12.5V, thus representing a potential 30% gain in charging efficiency. In the afternoon the controller was indicating that 'absorption' was in progress (with the voltage on my DC-DC converter for the SheevaPlug showing ~14V), and though I didn't see 'float' reached I'm confident that the battery was getting a good charge. Update 2009/10/06: Given a miserable day yesterday the continuous SheevaPlug load (2.5W--5W approx with 1W+ additional from the DC-DC converter) brought the battery down to perilously low levels overnight (~11.5V), so I've added another south-facing panel (amorphous, 12Wp) today and I will attempt to reduce the 'quiet'/low-power plug consumption 10% also. The total is now ~134Wp, though only 20+12+62=94Wp faces south. I have ordered a more efficient DC-DC converter also. Update 2010/01/01: My primary 24x7 off-grid load is my SheevaPlug which takes 5V @ ~4W, so at the moment I have a high-efficiency 12-to-5V DC-DC converter, one of the 7815 drop-in-replacements that is actually switch-mode inside. I had to put even its modest 0.1kWh/d load back to mains about 3 weeks over November/December due to long runs of dark days. I could beef up the system considerably to 48V to reduce wiring losses, and that 5V could probably be stepped down from 48V nominal just as efficiently. I have other 12V stuff such as LEDs that I could run via a 48-to-12V DC-DC converter if I did convert my off-grid system to 48V. I'd be making my several 12V solar controllers redundant though... However, what I could do is beef up my 12V system to ~200Ah (ie ~1kWh of usable storage) to run the SheevaPlug and 12V LEDs, and then after expanding my grid-tie PV one more time put in a 48V charger/inverter to which I can switch some off-grid PV panels in summer leaving more to export during the day... Then I could be running all the other loads over AC from my grid-tie store. Update 2011/01/14: Given the very poor insolation in December (less than half of typical), and indications that the capacity of the 40Ah gel SLA has greatly diminished, I have taken delivery of 4x100Ah 12V gel batteries, and with much of the cycling load preferentially taken by the LiFePO4 battery, may last for many many years at the releatively low currently that I shall use. Initial open-circuit terminal voltages are 12.52V. Discovered that I'd misread the initial switch settings on the Morningstar MPPT controller, and that it had been set for "sealed" (ie not "gel"), probably unkind to the old gel, and would not have been nice for the new ones. Absorbption voltage will now be 14.0V rather than 14.1V. Update 2011/01/28: Controller showing green (full) and voltage 12V night of 27th, but went red/LVD just before 09:00 on 28th (with LiFePO4 carrying system for a few minutes until plug put back on-grid). Battery voltage measured as 12.3V at controller (and the controller was indicating that it was charging the batteries) minutes later but LVD not reset for about 3h, after some sunshine. Update 2011/01/20: After a couple of weeks on float (ie no load, and some charge), after dusk the 40Ah gel was at ~12.7V. Update 2011/04/10: With only the SheevaPlug light load the SLA battery voltage was staying >13V even overnight, floating equal to the LiFePO4 voltage most of the time. Update 2012/03/15: ADSL modem moved off-grid until Autumn; SLA voltage now seen dipping below LiFePO4 ~0.2V at night. Update 2012/07/07: Bought Maplin N27JL 40W 12V amophorous panel £80 (ie £2/Wp) on offer to install vertically on south-facing wall in September. With its stripes vertical it should suffer relatively little from some shading from low objects in front of it (eg plants) providing I can avoid any vertical obstructions: the current bird feeder on a pole may need displacing a little for example. As I start this project I'm not sure what the most important metrics/stats are to monitor, and I certainly won't need to monitor the system every day. And in the end, it will be as much a matter of gut feel as of the numbers to decide whether the solar power is 'practical'. 2007/06/01 19:34 13V / full System set up today so only partial charge (though battery supplied charged). Bright direct sun most of the afternoon with some cloud. Dusk ~20:00 BST, battery shown as charging until ~19:30 BST. Started running lamp on half (8W) setting at ~20:30 BST, but used at a mixture of half/full light throughout the evening; still running at ~02:00 BST with charge controller showing 'full', battery voltage now maybe a shade lower just under 13V. Battery/study temperature ~29°C. 2007/06/05 09:41 13V / full No load on system, solar panel not in direct sunlight, but controller showing charging. Battery/study temperature ~24°C. 2007/06/05 11:22 13V / full No load on system, solar panel in direct sunlight, controller showing charging. Battery/study temperature ~24°C. Local noon, with Sun more-or-less due South face-on to panel, so probably maximum charging current/power available. 2007/06/06 13:48 13.5V / full No load on system, solar panel in direct (slightly-hazy) sunlight, controller showing charging. Battery/study temperature ~25°C. 2007/06/26 00:33 12.5V / full ~11W load (two lights) on, and have been on for many hours tonight while I slave over a hot keyboard... Blustery overcast day yesterday so possibly didn't get a full charge. Battery/study temperature ~24°C. 2007/07/04 13:39 12.99V / full Measured at solar controller load/output with no load using E-flite in-line; drops to 12.7V with ~10W load, and rises to ~13.05V to ~13.17V with no load and a little direct sunlight. Blustery cloudy rainy day, so poor conditions for charging, but the battery probably fairly fully charged. Battery/study temperature ~25°C. 2007/07/11 16:41 12.79V / half-full Some direct sunshine on (currently somewhat shaded) new 62W solar panel, but after some experimental powering of the laptop from the battery the controller is showing the yellow 'half-full' indicator for the first time. After a few minutes the SHS-6 is showing the green 'full' indicator again. Later under ~15W load ~12.4V and 'full'. Battery/study temperature ~26°C. 2007/07/16 10:52 13V / full Very gloomy overcast day, sun behind house, panels partly shaded by bushes, the nominal 82Wp panels pushing 2.5W into the battery at ~10:00 UTC, 5.2W at ~10:30, 6.5W at 10:54, 7.9W at 10:55, 10.5W (fluctuating) at 11:00, as the sky is starting to lighten, 13.3W at 12:18 with direct but diffuse sunlight, back down to 5.2W at 13:28 with the sky more overcast again. Battery/study temperature ~28°C. 2007/07/18 16:00 13.30V / full Fairly bright day with decent direct sunlight hitting the panels. The battery voltage has been significantly over 13V much of the day, and not falling off much with a 15W+ load applied. This suggests that lower and upper hysteresis levels of 12V and 13V respectively for the laptop low-voltage disconnect (LVD) circuit may well be reasonable. Battery/study temperature ~29°C. 2007/08/04 14:30 14.20V / full Fairly bright day with decent direct sunlight; no power draw for about 1 week. After <10m powering laptop (and mobile charger) down to ~13.10V. Battery/study temperature ~27°C. 2007/08/05 12:30 14.15V / full Bright and hot day with direct sun. Laptop in 'full power' mode (est ~50W) for a while, but power drain too high, and so LVD dropping out and reconnecting (oscillating). Forced to usual 'power conservation' mode (est ~20W from battery), has been running fine even after sunset for a total of nearly 5 hours. (One neat thing about the k8055 USB digital input board that I am using is that it counts the oscillations/cycles for me, so I don't miss them if I blink.) Battery/study temperature ~27°C up to ~31°C. 2007/08/06 18:52 13.11V / full After nearly 4 hours powering the laptop, back on-grid some time ago. Sun still up so battery still charging (slowly); unlikely to take laptop off-grid again today. Battery/study temperature ~24°C. 2007/08/07 22:00 12.73V / full After ~2.5 hours powering the laptop, back on-grid some time ago. Reading light on. Battery/study temperature ~24°C. 2007/08/08 06:30 12.98V / full Already charging on bright and sunny morning. Battery/study temperature ~22°C. 2007/08/10 20:47 12.72V / full After ~4.4 hours powering the laptop, and reading light for ~1hr. Laptop on solar power in the hours of 11h to 15h UTC inclusive, see extract of stats page below. Battery/study temperature ~27°C. 600 samples have been taken. 132 samples indicate use of off-grid power. 0000 UTC was the time of the first sample. 1958 UTC was the time of the last sample. Off-grid power has been used for this server in 22% of the samples. 2007/08/23 22:34 12.08V / full After a very gloomy day (following several others!) when I'd had to have the light on during some of the day too. The next morning the battery voltage was rising as follows: 12.32V@07:12, 12.47V@08:03, 12.53V@08:44, though after applying a ~C/10 load for a couple of minutes voltage fell to 12.47V, indicating significant 'surface charge'. 2007/08/24 21:03 12.34V / full After another gloomy day, with the ~15W light on, so no 'surface' charge. Down to 12.28V at 21:39. Battery/study temperature ~27°C. 2007/08/25 14:21 13.32V / full Bright direct sunlight all afternoon so far. Laptop/server load on (~20W) since about noon UTC. Battery/study temperature ~24°C. 2007/08/26 13:21 13.95V / full Bright direct sunlight all day so far. Laptop/server load on (~20W) since 10-ish UTC (about 3.5 hours @ 20W). Voltage has been steadily rising all day which means the battery is charging over and above the laptop's power draw, which is as it should be. Voltage dropped again as sunlight angle to panels became more oblique later: 13.13V@15:18, 13.05V@16:21, 12.92V@16:52, 12.85V@17.36. After the LVD dropped the laptop load after ~7.3hrs off-grid, the record so far, battery voltage rose to 13.04V, where it stayed for a while. Later samples: 12.99V@19:10, 12.80V@20:06 (lights on), 12.73V@21:00 (lights on), then 13.12V@07:42 and 13.24V@08:43 next morning trying to cut in. Battery/study temperature ~26°C. 540 samples have been taken. 219 samples indicate use of off-grid power. 1758 UTC was the time of the last sample. Off-grid power has been used for this server in 40% of the samples. 2007/09/01 16:61 13.18V / full Slightly to heavily overcast today. Laptop/server load for over 7h today, but off for about 20m before this sample. Battery/study temperature ~23°C. 2007/09/04 10:00 13.18V / full Alternately sunny and cloudy/overcast today. Direct sunlight is about to hit the smaller 20W panel (now tilted at ~45°) in the current test arrangement. Laptop has only been off-grid for <10mins so far, but expecting it to be off-grid as soon as the small panel is fully lit as the battery is pretty-well full already and the laptop needs <20W. (However, there is a bit of shading and the sun is significantly oblique to the due-south-facing panel at this time, so at 10:15 the laptop is still not quite off-grid even with the small panel lit, but it's just about to go... 10:17 off-grid. B^> ) Eventually got more than 8 hours off-grid: a record so far on this system! Battery/study temperature ~19°C. 2007/09/06 14:40 13.56V / full Slightly overcast with sunny gaps today. New 'full power' (excess dumping) sensor kicking in at around 13.56V, though generally only in small bursts of a few seconds giving isolated 'on' samples because the battery isn't full and the sky isn't clear. When it does come on the laptop cranks up to use the extra energy, eg setting the 'ondemand' maximum CPU clock to full speed, and doing some speculative work on my AI project. Battery/study temperature ~24°C. Also connected up my new tiny (~1W) test wind turbine, mainly to be able to monitor how much wind power is available, but also for a tiny top-up charge to the battery. Since the turbine AC output voltage is only ~5V, I had to build a small Cockroft-Walton voltage multiplier to get to over 12V. Battery/study temperature ~23°C. 2007/09/11 19:32 12.60V / full Bright sunny day; laptop off-grid for >8h, with ~2h 'dumping'/'full-power'. Voltage reading a few minutes after laptop went back on-grid. Battery/study temperature ~23°C. 2007/09/17 09:08 12.99V / full (Recorded just under 1 hour of usable wind power yesterday.) Grey overcast day. Battery/study temperature ~20°C. 2007/09/28 22:24 12.72V / full Dark overcast day, with zero off-grid time. A little less than 1 hour of usable wind power was recorded. Battery/study temperature ~19°C. 2007/10/26 22:34 12.75V / full No off-grid time for the laptop for a couple of days, due to cloudy skies, but battery evidently being kept topped up anyway. Battery/study temperature ~15°C. 2007/11/14 10:27 13.17V / full Sun not quite on panels yet. Maybe an hour or two (~2Wh?) of wind power so far. (Cut-in, ie the laptop going off-grid, at 10:38, with the 20W panel in full sun, and the battery voltage pulled down to 13.05V, and no oscillation. By 11:02, both panels in full sun and battery voltage up to 13.69V.) Battery/study temperature ~15°C. 2007/12/21 21:41 12.60V / full Managed >2h laptop off-grid today on probably the shortest day of the year! Battery/study temperature ~19°C. 2008/01/30 19:15 12.67V / full Managed >5h laptop off-grid today! Battery/study temperature ~18°C. 2008/06/04 20:15 12.98V / full Managed nearly 11h laptop off-grid today in spite of partially cloudy day. The off-grid PV rating is now ~120Wp, with a mixture of PV technologies, and in addition to 82Wp south-facing and tilted, the remainder is in near-horizontal amorphous on the east and west sides of the house to attempt to maximise summer sun capture time (and diffuse light). 362 samples (60%) indicate use of off-grid power (yesterday 314). 35 samples (5%) indicate wind power available (yesterday 18). '.' indicates off-grid; '*' indicates off-grid and 'full-power'/'dumping'. Note: the relationship of State-of-Charge (SOC) of the battery to 12V-lead-acid voltage is complex, and depends in part on whether the battery is charging or discharging and also ambient temperature, and the curves depend slightly on the details of battery construction too. But as a rule of thumb, a value of ~11.5V or less indicates a damagingly-low charge state, and much over 14V indicates that the battery is fully charged and still being supplied with a charge current (so it's disconnect or dump time!). The SHS-6 Morningstar controller regulates charging at the top-end at 14.3V and disconnects the battery to protect it if its voltage falls below 11.5V. A small solar anglepoise in Shropshire, UK, from 'GotWind' (12V, 5W solar panel, 12Ah battery, 11W CFL bulb). A working 12V DC system in Suffolk, UK. Read about solar power water heating in Kent, UK. An example of real off-grid living in Canada. Away from densely-populated areas of the developed world it may often be cheaper to install RE systems (solar/wind/etc) than get any sort of grid connection. The hyper-'wired' Bwired.nl Netherlands home. I've been forbidden from even thinking about it! A technical (eg non-maths-lite) but good discussion of solar PV behaviour and performance. Energy & Environment Ltd has a good range of batteries, solar panels, etc, at good prices. Also see this AWG to mmsq table. The SmartGauge battery monitor site. Simple 12V battery monitor circuit which could be adapted to use an opto-isolator to drive some sort of digital 'low battery' warning input to a computer. See [defunct: "http://www.xephi.co.uk/laptops/"] XePhi for Linux laptops tweakable for low-power running. Insolation in the UK is approximately 1MWh/m2/year for an optimally tilted but fixed panel (Renewable Energy, Godfrey Boyle, 2004). Solar PV is barely 15% efficient from light to usable electricity, so might gather 0.15MWh/m2/year as usable electric power. A UK PV installation with 20%+ efficient cells and 17%+ efficiency to stored DC will almost certainly not exceed ~0.9MWh/kWp/year (kWp rating of the cells), and only 20% of that energy is available in the winter 6 months when most needed in the UK (as we don't generally need domestic aircon for example). The EU's Solar Electricity Action SOLAREC programme (map of solar energy potential in Europe 12MB PDF). 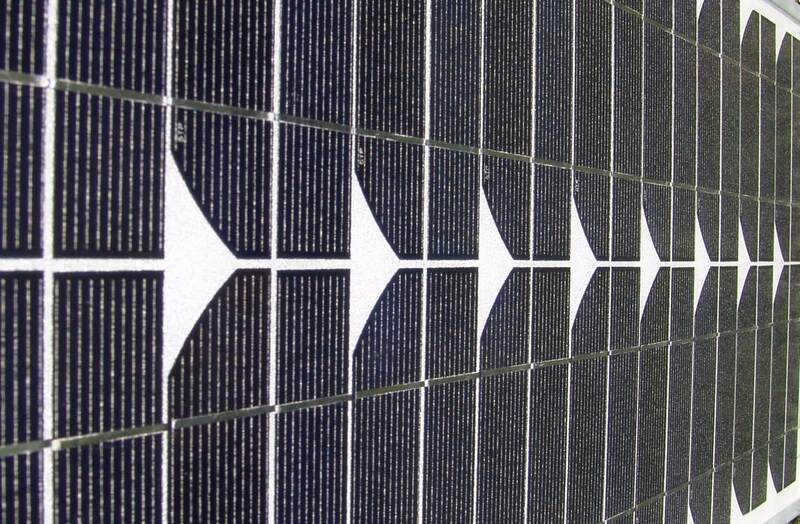 The European Photovoltaic Industry Association (EPIA). Scientific American January 2008 issue: "A Solar Grand Plan": A massive switch from coal, oil, natural gas and nuclear power plants to solar power plants could supply 69% of the US's electricity and 35% of its total energy by 2050... Excess daytime energy would be stored as compressed air in underground caverns to be tapped during nighttime hours. Map of available solar energy in the UK c/o the Solar Trade Association. 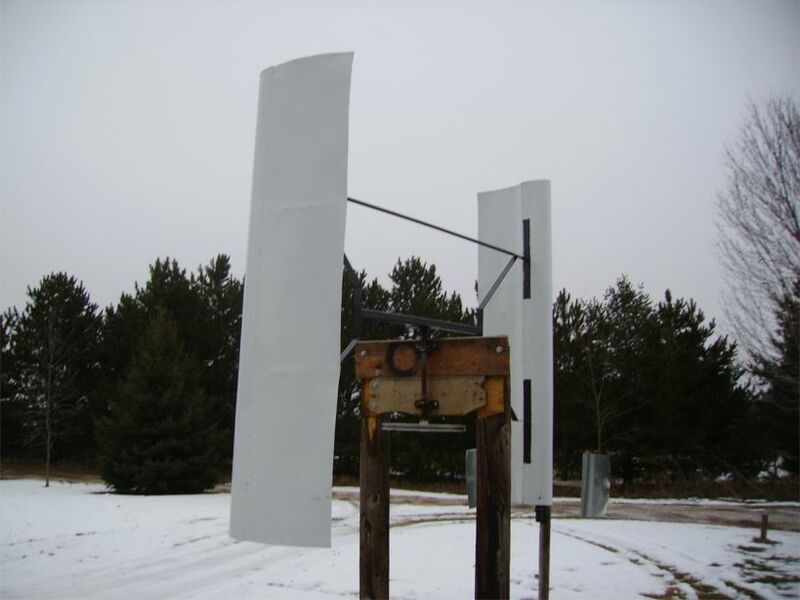 Looking for 24 Volt turbines, solar PV, etc? The site of Afghan Solar. The San Francisco (California, US) Solar Map of solar (PV) installations around the city: as of 2008/08 totalling 795 installations, 54MW rated, 8.8GWh/y produced. The Boulder (Colorado, US) solar installations map c/o Mike Spainhower. First published 2007-08-08 , updated 2019-04-22 , rebuilt 2019-04-23 . Site copyright © 2007-2019 Damon Hart-Davis. Hosted by ExNet.